Point-Counterpoint: Will Tort Reform Control Medical Costs or Ultimately Harm Patients? 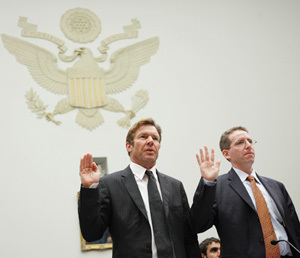 The actor Dennis Quaid testified at a hearing of the House Oversight and Government Reform Committee in May, 2008 on Food and Drug Administration drug and medical device regulations and state liability claims. America’s medical malpractice system is one part Rip van Winkle and one part Anna Nicole Smith. It’s Rip van Winkle because malpractice policy usually lies dormant for a decade or more until it hears the clamor of a liability insurance crisis. Once awakened, moreover, it typically acts as if the health care system has not changed since its prior revival. Why Anna Nichole Smith? Because malpractice liability is a train wreck that Americans can’t help watching. Once captivated, the public imbues malpractice with importance to the U.S. health care system far beyond that indicated by objective criteria. Malpractice experts and the public agree that medical liability is broken, but cite different causes and effects. Experts often explain that tort liability is a predictable social response to burgeoning health care technology: As expectations of success rise, failures become more apparent, and the cost of additional treatment grows. But they readily concede that too many medical errors are undeterred by malpractice risk, that too many injured patients receive no compensation, that the litigation process is unconscionably miserable and expensive for all concerned, and that liability insurance markets are badly organized and unnecessarily volatile. These balanced assertions cannot compete for public attention with the dueling political narratives of "tort reform." One set of advocates tells a story of predatory lawyers who drive honest doctors from practice and bleed the health care system of hundreds of billions of dollars each year in "defensive medicine." The other offers tales of profiteering insurance companies slapping physicians with exorbitant premiums and then turning their backs on piteous victims and grieving widows. What would feel more satisfying, both sides ask voters and their elected representatives: reorganizing a complex system or punishing a greedy villain? The patient safety movement might help overcome this impasse. Well-publicized revelations of widespread medical error force the medical profession to examine its own practices as well as those of its legal opponents. Attention to clinical safety moves the redress of injury farther from the courtroom and closer to the bedside, where it can happen more quickly, less expensively, and more accessibly for patients. Being creative about preventing errors and being honest about disclosing them is a self-help measure that needs no endorsement by courts or legislatures. These professional commitments also restore a modicum of control to physicians, whose distress over malpractice compounds a general sense of lost authority as their judgment is questioned, their prices are challenged, and their documentation is criticized by those who seek their services and pay their bills in a $2 trillion health care system. Still, comprehensive malpractice reform remains unlikely. The established imagery of malpractice is too vivid, and the political combatants are too entrenched. Unfortunately, this impasse may jeopardize not only improvements to the malpractice system, but also health care reform in general. Thinking about reform in collective terms—healthy communities and a healthy nation—is critical to improving our health care system. As long as medical malpractice holds our attention, however, we will only be able to envision our health care system one physician and one patient at a time. William M. Sage, MD, JD, is the vice provost for Health Affairs and James R. Dougherty Chair for Faculty Excellence at the University of Texas, Austin. B. Black, C. Silver, D.A. Hyman, and W.M. Sage. "Stability, Not Crisis: Medical Malpractice Claim Outcomes in Texas, 1988-2002," Journal of Empirical Legal Studies 2 (2) (2005): 207-259. T. Feinman, MD. "Malpractice: A different kind of tort reform." Medical Economics, August 5, 2005. W.M. Sage. "The Forgotten Third: Liability Insurance and the Medical Malpractice Crisis," Health Affairs 24 (4) (2004): 10-21. D.M. Studdert, LLB, ScD, MPH, et al. "Defensive Medicine Among High-Risk Specialist Physicians in a Volatile Malpractice Environment," Journal of the American Medical Association 293 (21) (2005): 2609-2617. M.M. Mello, D.M. Studdert, C.N. Desroches, J. Peugh, K Zapert, T.A. Brennan and W.M. Sage. "Caring for Patients in a Malpractice Crisis: Physician Satisfaction and Quality of Care," Health Affairs 23 (4) (2004): 42-53. In order to grasp the complexity of the current medical malpractice "crisis," we need to understand the legal and social contexts. What exactly is malpractice? What does tort reform mean? And why is it so important to health policy generally? Medical malpractice is negligence on the part of a health care provider (usually a physician) that causes an injury to the patient. It is legally defined as the failure to exercise the degree of care and skill that a reasonably prudent physician would use under the same or similar circumstances. This is generally called the standard of care. An expert witness (for example, a doctor of the same specialty) is required to establish both the standard of care and a failure of the defendant doctor to conform. Malpractice is not a crime or a breach of contract—it is a tort. A tort is a civil wrong for which a remedy (usually money damages) can be obtained by law. It is a breach of the special duty that skilled professionals such as doctors have in excess of the ordinary person. Tort law and insurance regulation are traditionally under the purview of the states. Tort reform advocates seek to reduce the amount and costs of tort litigation, usually through legislation that restricts tort remedies or that caps damages—especially non-economic damages, such as compensation for pain, suffering, loss of companionship, or other hardship. These advocates argue that tort reform would lower insurance and health care costs and prevent windfalls for plaintiffs and their attorneys. Opponents contend that it denies plaintiffs the compensation they deserve for their injuries and undermines the deterrence of medical errors. Is there a medical malpractice crisis? There is general agreement that the medical malpractice system in the United States is inadequate, but there is no consensus on whether it’s in "crisis." When physicians describe a crisis, they mean the lack of availability and affordability of malpractice insurance. On the other hand, many victims of malpractice never receive compensation for their injuries. Policymakers focus on whether practice patterns are significantly affected by the lack of affordable insurance. In other words, a crisis exists when physicians are forced out of practice or into early retirement, leave the state or area, or discontinue high-risk procedures, such as delivering babies. From a community standpoint, these practices all reduce patients’ access to care. There is widespread geographical variation in such access based on the regulatory and judicial climates in various states. Why is medical malpractice important in health policy? Malpractice lawsuits can further important social goals, including the deterrence of unsafe practice, the punishment of negligent physicians, and the compensation of patients injured though negligence. In litigation these goals are imperfectly realized. As noted in the landmark Harvard Practice Study, only a very small percentage of those patients injured by negligence even file a claim. The researchers found no relationship between the presence or absence of medical negligence and the outcome of malpractice litigation. Only the degree of injury predicted outcome. In addition, the current practice of patient suing doctor does not address medical errors due to system inadequacies and inflicts a great deal of collateral damage on competent and caring physicians. Malpractice lawsuits are an inefficient means of delivering compensation to victims. The current malpractice climate may cause physicians to avoid certain geographic areas and high-risk patients and procedures. The costs of defensive medicine (defined as a deviation from sound medical practice induced primarily by a threat of liability) are real if difficult to measure. A study published in the New England Journal of Medicine found that, among high-risk specialists, 93 percent reported that they sometimes or often engaged in defensive medicine. At the same time, efforts to fix a broken liability system must address the fundamental question: How can we make health care safer for patients and avoid medical errors? 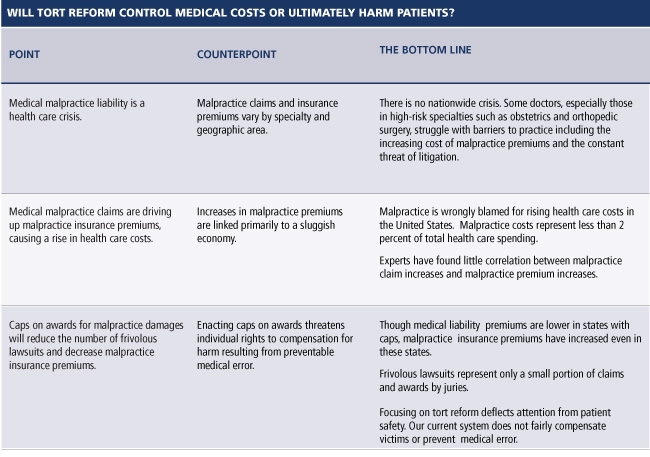 Any malpractice reform effort must balance the interests of injured patients, doctors, and the insurance industry, all while recognizing the universal goals of lowering costs, improving access, and ensuring quality. The goal of stabilizing malpractice premiums may not align with the goals of tort law: improving quality by deterring future incidents of negligence and providing fair compensation for those injured. Despite these challenges, there is no shortage of reform proposals. Most tort reform legislation, at both the state and federal levels, is centered on capping award payments. Capping awards may provide juries with a more consistent framework, but critics argue that capping at some arbitrary level will inevitably result in underpayment for some actual victims with minimal effect on premiums. Proposals aimed at capping award payments place a ceiling on the amount a jury can award for noneconomic damages, but do not limit awards for economic damages (medical costs, continuing care, and lost wages). However, the Physician Insurers Association of America estimates that of all medical malpractice claims filed in the United States, only 5 percent go to trial and 80 percent have defense verdicts. A mere 0.9 percent end in a jury verdict for the plaintiff, and are thus subject to these caps. As a result, caps are likely to have a negligible and probably indirect effect on health care costs. In addition, some claim that caps only provide a "band-aid" fix and do nothing to promote patient safety. Other proposed solutions attempt to create a more equitable system. These include measures that define more precisely the standard of care, such as using evidence-based medicine. In addition, methods to compensate patients in a more uniform, prompt, and efficient way are being explored. These include a no-fault system, such as that used in New Zealand and Scandinavia. A no-fault system usually provides a prompt predetermined payment to an injured patient without placing blame on the provider, similar to auto liability. Screening by independent experts or panels prior to beginning litigation may help eliminate frivolous lawsuits. Consistent administration through health care courts may prevent widely disparate verdicts and awards. Malpractice insurance redesign including coverage through hospitals and expanded risk pools may take some of the burden off physicians. Lastly, immediate disclosure of errors, apologies, and aggressive efforts to remediate the mistake may stem the number of patients seeking compensation through the courts. R.A. Berenson, S. Kuo, and J.H. May. "Medical Malpractice Liability Crisis Meets Markets: Stress in Unexpected Places." Center for Studying Health System Change, Issue Brief No. 68. September 2003. K.E. Thorpe. "The Medical Malpractice ‘Crisis’: Recent Trends And The Impact Of State Tort Reforms." Health Affairs (2004). The Henry J. Kaiser Family Foundation, "Background Brief: Medical Malpractice Policy," March 15, 2005. D.M. Studdert, Y.T. Yang, and M.M. Mello. "Are Damage Caps Recessive? A Study of Malpractice Jury Verdicts in California,"Health Affairs 23 (4) (2004): 54-67. "Don’t take it personally," advised my lawyer when I was sued early in my career. I wanted to quit. Lying awake at night, I replayed every moment in the delivery and asked myself why this patient to whom I felt so close could turn on me. Of course, Viv and I were not allowed to talk after I got "the letter." My colleagues and I call these "lawyer letters," and they always seemed to be on your desk when you returned from a vacation. It was months later at my deposition when I inadvertently bumped into Viv in the restroom during a break in the grueling 8-hour ordeal. "I did not want to sue you," she blurted out tearfully, "I just wanted the baby’s speech therapy covered." The patient dropped the lawsuit soon afterward, but that confession still sticks in my head 25 years later. Several more lawsuits came and went over the years, but it never got any easier. Twenty years and 12,000 babies later, another lawyer letter arrived. I did not know this patient very well—I just happened to be on call the night she went into labor. Her baby developed seizures in its first few hours of life and was diagnosed with cerebral palsy within a few days. There was nothing particularly unusual about her prenatal course, her labor, or her delivery (as is most commonly the case with cerebral palsy). The baby showed minimal signs of distress in the last few minutes prior to birth, and I applied a suction device to facilitate delivery. But the mother was angry. It had to be someone’s fault. Surely a C-section would have helped. It must have been the vacuum device that caused the brain damage. I knew none of these were true, but she was determined to pursue her malpractice claim. She changed lawyers three times over the span of four years. Each time we started the now-familiar process all over again. The sleepless nights, (especially bad for an obstetrician who needs all the sleep she can get) and the worry. Replaying the scene hundreds of times in my head, I asked myself, "What would I do differently if I encountered the same circumstances again?" The answer was always the same: nothing. The other party agreed to settle for the policy limit of my liability insurance: $1 million. Off the hook, over and done with—it was tempting. But settling seemed a cop out, only perpetuating the problem, so I made the difficult decision to take the case to trial. Taking this case to trial was risky. This patient was suing me for $32 million in economic damages alone, way beyond the limits of my policy. If I lost, any amount over $1 million would come out of my pocket and I would face financial ruin. I convinced myself that it would at least be a good learning experience. What I learned was painful. We frequently ask patients to rate their pain on a scale of 1 to 10, 10 being the worst pain they have ever experienced or could imagine experiencing. Every day of the two-week trial was an emotional 10. I prepared for weeks, spent countless hours away from my patients and my family. Day after day, I faced my "opponents": an angry mother, totally devoted to her severely handicapped, now 8-year-old son with cerebral palsy, and a skilled trial lawyer, well-known for getting compensation for victims of airplane crashes. The trial opened with a "Day in the Life" video: a gut-wrenching and powerful tool used by plaintiff’s lawyers to demonstrate the child’s condition and gain sympathy from the jurors. The video showed the young mother caring for her child every minute of every day, chewing his food first and then feeding it to him so he would not choke, lifting him, now 80 pounds, flailing into the bathtub, changing his diapers, and reading to him only to get the familiar blank expression in return. I wondered if I would have been as doting a mother and if I would have also blamed the doctor. I thanked God and felt a little guilty for my four healthy children. I watched the gripping effect on the jurors when the child was wheeled into the courtroom. I listened over and over again to a mother unable to control her sobbing. Descriptions of my inattention, carelessness, incompetence, and greediness became familiar. I was accused of lying, falsifying the medical record, and even harming the baby intentionally. I heard so-called experts claim that the child might be playing with friends, laughing, riding a bike, and reading comic books if I had only performed a Caesarean section. Fortunately, the jury considered the facts objectively and rendered a quick verdict in my favor. But in no way did I feel like I had won anything. After the verdict was read and still in the jury’s presence, the mother yelled at me, "You did this to my baby." The bailiff escorted her out of the courtroom. There was no celebration. No high-fives or toasts. I headed directly to the hospital. I was on call and someone was in labor. The effect of medical malpractice lawsuits is widespread. Patients, particularly those who are high-risk or living in underserved areas, are already having problems finding care, while rising insurance premiums and a culture of fear are deterring talented medical students from entering obstetrics. There are no longer any family medicine doctors delivering babies in Austin, Texas. My OB-GYN colleagues are retiring early and limiting their OB practices. And obstetricians who are still delivering babies are demoralized, frustrated, and just plain tired. The pipeline for obstetricians may be drying up, begging the question: Who will deliver the net generation? (see Robinson, et. al. "The Impact of Medical Legal Risk on Obstetrician-Gynecologist Supply" and Queenan, "Professional Liability Insurance: Still a Crisis" both in Obstet Gynecol (2005):105). As a new lawyer and a public policy student, I have a responsibility not only to formulate the problem, but also to participate in the solution. We as a society must accept the responsibility for individuals with medical needs. Parents caring for a handicapped child should have resources available to them other than suing their obstetrician. The medical community must continue to explore ways to prevent medical errors and protect patients. When errors do occur, early and honest disclosure and offer of fair compensation should be the norm. Philip K. Howard and his colleagues at the Harvard University School of Public Health are on the right track when it comes to monitoring this new liability system. His model of specialized administrative courts, dedicated judges, neutral experts, and explicit compensation guidelines could help set standards for future health care delivery and improve the quality of care. Even in the empirical world of policy, some things just cannot be explained in a pie chart, graph, or spreadsheet. As I evaluate the promising reform measures outlined in this issue, I come back to the same conclusion that I had on the last day of my trial: "There has to be a better way." Actor Dennis Quaid and his family learned first-hand last year just why the courts are often the only path to justice for families that are harmed by drug company negligence. Read his testimony before Congress here. The Wall Street Journal examines the influx of doctors to Texas following its malpractice reform in 2002. Read it here. A study on Massachusetts shows lower inflation-adjusted malpractice insurance rates in 2005 than 1990, even without a major reform. Read it here.